Founded in April 2006, Alert Nerd was a blog that spat hundreds of thousands of words into the ether on all kinds of geeky stuff. 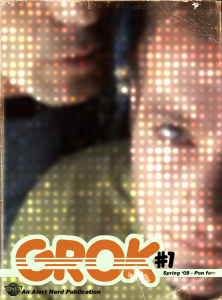 From it grew Grok, a PDF zine that marries the indie aesthetic of the ‘zines you’d make in high school with genuine quality content from some of the best minds on the Web, from bloggers to award-winning novelists and nerd celebrities. Alert Nerd Press is the independent publishing division of Alert Nerd, dedicated to creating and distributing geek-centric fiction and nonfiction for the discriminating nerd, both digitally and in print. Sometimes we spit out music, and that’s what Alert Nerd Records is for. Use the links above to check out our projects, or slide on down the page and make with the clicky on the attractive story banners to your right, our left. Posted by Matt Comments Off on Here We Are.